There is the possibility to set breakpoints in behavior methods as well as in generator templates. But I haven't found out how to use them. It would be great if I could step through statements of the generation process. Do I have miss this feature or is it not possible (yet)? But I really don't understand why there is a new MPS instance necessary. I will have a closer look to your other answers in the next days. Yes of course, this makes sense. But I'm surprised, that my generator runs in the same process as my IDE when I'm designing a language with its generator. Then the classes of my generator must be reloaded every build anyway. I think this is also the reason why I must rebuild the generator to apply changes in it. Mostly a make doesn't help here. This is a bit annoying. BTW: If I debug with another MPS instance I must open the project in both instances since the sandbox and the generator is in the same project. But where do I should change my generator if I've found the error? Do I need to restart the second instance afterwards? 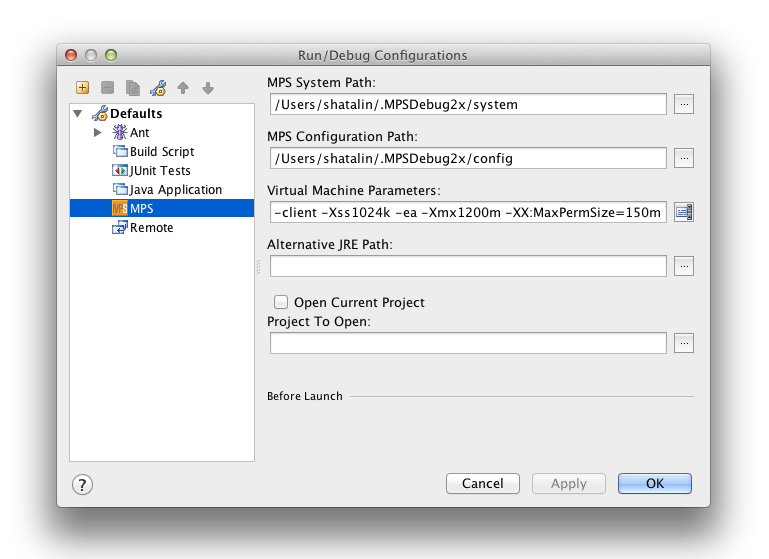 The language is loaded/reloaded into a current MPS instance on building/rebuilding it. It's not possible (or we were not able to develop the way) to debug it in-place. Make should work. If it's not working you can try filing request with the sept to reproduce it (if possible). Yes. You have to restart "second" instance.